Go See Campus helps high school students and parents plan campus visits online and make the most of the college search. Its signature application, The College Trip Planner, is a first-of-its-kind web tool that connects users to tours, information sessions, and other admissions activities at hundreds of schools. They can download campus maps, get parking directions, and make travel arrangements from the site. Dates and times are saved in itineraries students can take on the road. According to founder Kevin Preis, the site had a quiet launch in March 2010 to prepare for the fall admissions season. It is managed by Augmental, a company that provides content development services and search engine optimization to clients in a variety of industries. Mike: You chose a brandable name for your online business, GoSeeCampus.com. What characteristics were you looking for in a domain name? Kevin: I wanted a domain name that was both descriptive and evocative. Go See Campus explains what the site helps you do, and it also brings to mind the college trip experience. Marketing research and search engine optimization were key factors in choosing the final domain name. While other names I considered were descriptive, Go See Campus tied most closely with my audience’s sentiments about hitting the road to visit schools: excitement, nostalgia, and so on. Kevin: I purchased the domain name directly from a domain registrar. Mike: Can you share the traffic stats your site receives? Mike: I see a screen shot on the site that shows a pretty cool feature. 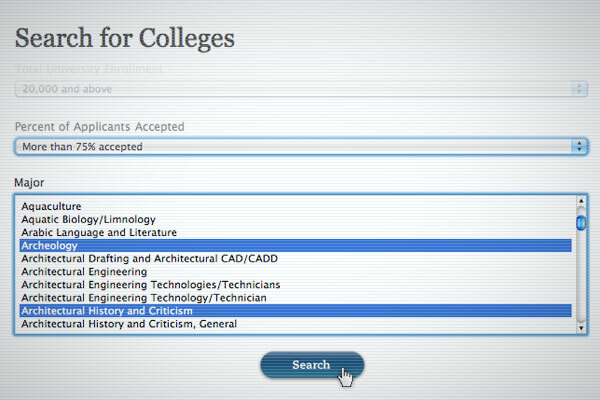 Potential students can select colleges and majors and see what percentage of applicants are accepted. How do you collect this data? Are there other, similarly cool features? Kevin: Thanks, I’m pretty excited about it as well! The data sources throughout the site are a mixture of publicly-available information and primary research. The college search tool you mentioned lets students find schools in which they have interest. Then, they can add these schools to a college trip plan. It saves students and parents tons of time because they can learn about different admissions activities on each campus and then create their itineraries. Mike: How do you market the site? Do you use online strategies, offline strategies, or both? Kevin: Yes, it’s a combination of offline and online, including social media, search engine optimization, partnerships, and public relations. Kevin: Domain names are extremely important, but finding a good one is not as rare as you might think. Start with understanding your audience and how the product serves it, and then work through the related keywords and semantic phrases. There are a few good domain name suggestion tools that can help you as well. Kevin: Whether you blog, Tweet, or share content in other ways off-site, remember to keep your brand name consistent. For example, I stick with Go See Campus on Facebook or Go See Campus on Twitter. If someone has snatched up your name on these sites before you could, look for other ways to tie back into the brand or to slightly vary your account name. Better yet, look at the availability of a brand name on major social media sites before you settle on one for your website. Wow, what a great site. I wish I would have know about it when I was searching for colleges.